I was recently asked about the relationship between the plaque on your teeth and the plaque in your arteries. While both share the same spelling, the two are unrelated. An increase in one does not cause an increase in the other. Oral plaque is a sticky, colorless film of bacteria and sugars that form on our teeth. It is the main cause of cavities and gum disease, generally due to poor oral hygiene. Cardiovascular plaque is the buildup of cholesterol, inflammatory cells, and white blood cells (macrophages). While the “plaques” are unrelated, heart disease and gum disease are strongly related. The connection between cardiovascular disease and dental health requires a shift in our thinking. It is important to understand that cardiovascular disease is really an inflammatory process. It then makes perfect sense that your oral health is very much tied into your cardiac health and by extension, any inflammatory process anywhere in your body will increase your risk for cardiovascular events. Specifically when we are dealing with oral health and periodontal disease, periodontal disease is the inflammatory disease of your gums. And when left smoldering for long periods of time, your inflamed gums can directly increase your risk for a heart attack. When you have gum disease, your body produces inflammatory chemicals called cytokines. These are secreted into your bloodstream and act as the fuel for inflammation wherever an inflammatory process going on. In order for disease to occur, there has to be inflammation. When you have damage, the inflammatory process known atherosclerosis takes over. In that situation, where you have underlying damage to the lining of the arteries, the inflammation in your mouth adds fuel to the fire and accelerates the process. Here is another theory. There is an actual bacteria present in your gums capable of infiltrating your arterial wall, leading to coronary disease. There are case studies where they found actual bacteria growing in cardiac plaque. Coronary plaque is similar to a pimple. When a pimple or artery explodes, your body’s natural reaction is to clot it off. That clot is what blocks the artery and causes a heart attack. The mouth is the gateway to total body wellness. So take care of your teeth and gums. 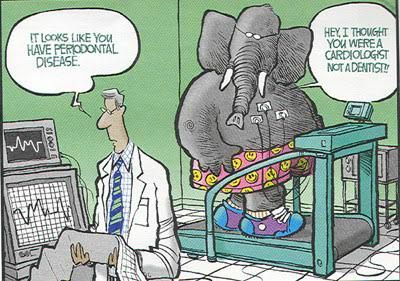 Brush, floss and see your dental care professional. Your whole body will thank you! How’s that for a simple solution?